Chiropractors are not ones that would normally condone the sport of auto racing as one of the best for a person’s back. Granted, it isn’t nearly as bad on a person’s back as football or hockey, but auto racing has offered drivers its share of back problems to racecar drivers throughout the years. But Jason Burchard isn’t going let a little advice from a chiropractor stop him from following his racing dreams. Even if that advice is coming from the professional version of himself. The win didn’t come easy for Burchard. He qualified second to Wil Smith and trailed Smith much of the night, as did the rest of the field. However, things changed big time on lap 24, when the lapped car of Tyler Smith spun in turn four. As the field moved high and low to get around the lapped car, leader Wil Smith had no where to go and clipped the lapped car, causing extensive damage to both vehicles. That handed the lead over to Burchard, who didn’t let a little bit of pressure from Ben Stancill slow him one bit. Burchard (#33, top) might have won the race, but Fred Hardwick (#16, bottom) had the fastest car/truck there. 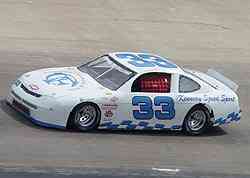 Instead, Burchard, a professional chiropractor in Murfreesboro, Tennessee, decided to chase his racing dream. And it all paid off, when Burchard won Saturday night’s 30-lap Aaron’s Pro Challenge Series race at Bristol Motor Speedway, a precursor to the Food City 150 Late Model Stock Car race later that evening. Burchard brushed his “getting loose” off lightly. In reality, when he got loose in turn three and fell back to third, he was practically facing the inside wall after the car jumped sideways. Just saving the car was a feat in its own. Some wait years and years to race at Bristol Motor Speedway. Burchard had to wait just a few years to race at Bristol… and to win at Bristol. 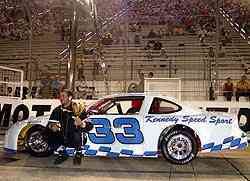 “I started racing when I was in Birmingham, Alabama and raced Mod Lights for about two and a half years. Just recently, I moved to Murfreesboro, Tennessee to open up a new chiropractic practice. That is a busy business, but I will wanted to be able to race. Fred Hardwick made the biggest move of the night. After starting ninth, the driver of the #16 Dixie Stampede truck used great restarts to fly through the field and get up to second at the end of the night. Stancill, a regular in the Legends Division in the Southeast, finished third. 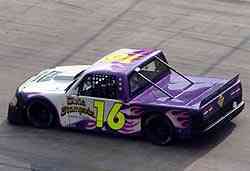 Early race leader Wil Smith finished 16th after getting involved in the late race accident.